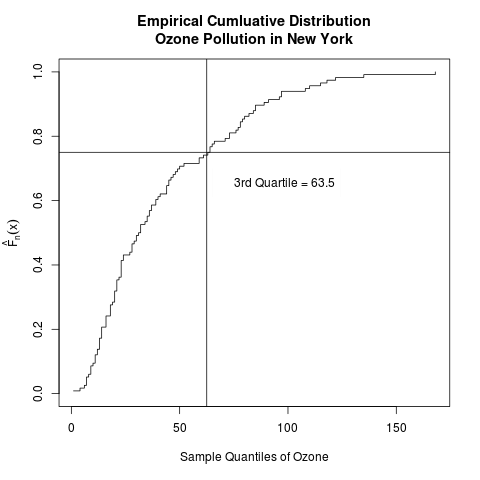 First, let’s get the data and the sample size; note the need to count the number of non-missing values in the “ozone” data vector for the sample size. # calculate the number of non-missing values in "ozone"
Now, let’s use the ecdf() function to obtain the empirical CDF values. You can see what the output looks like below. Finally, use the plot() function to plot the empirical CDF. Note that only one argument – the object created by ecdf() – is needed. Also note my use of the mtext() and the expression() functions to add the desired “F-hat-of-x” label. For some strange reason, the same expression used in the ylab option in the plot() function does not show the “hat”. I’m very glad that mtext() shows the “hat”! Notice that “[n]’ is used to write “n” as a subscript. plot the cumulative probabilities against the ordered data. This method does not use any function specifically created for empirical CDFs; it combines several functions that are more rudimentary in R.
It plots the empirical CDF as a series of “steps” using the option type = ‘s’ in the plot() function. Notice that the vector (1:n)/n is the vector of the cumulative probabilities that are assigned to the data. I have also added some vertical and horizontal lines that mark the 3rd quartile; this gives the intution that the CDF increases quickly and that most of the probabilities are already assigned with the small values of the data. In case you’re wondering how I got the 3rd quartile, I used the summary() function on the output of the fivenum() function as applied to the ozone data. Min. 1st Qu. Median    Mean     3rd Qu. Max. Did the Ozone Data Come from a Normal Distribution? 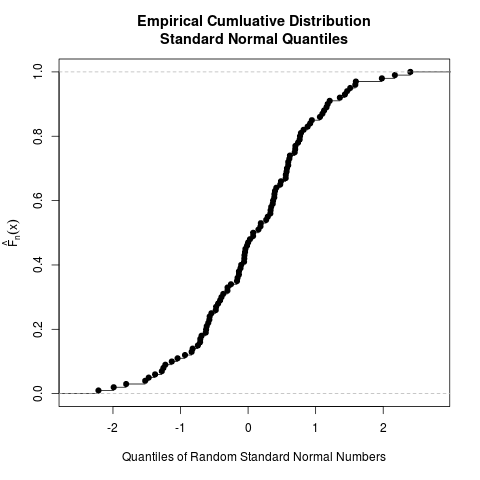 Recall the empirical CDF plot of the random standard normal numbers from my last post on the conceptual foundations of empirical CDFs. Comparing this above plot to the plots of the empirical CDFs of the ozone data, it is clear that the latter do not have the “S” shape of the normal CDF. 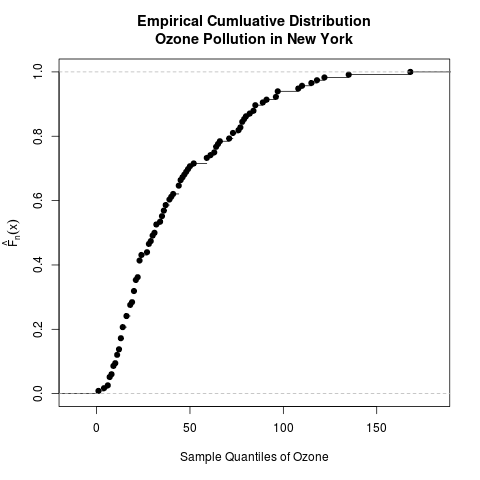 Thus, the ozone data likely did not come from a normal distribution.